Do you have a significant other who may not like the traditional candies and flower on Valentine's Day? Well a Fresno restaurant has you covered. FRESNO, Calif. (KFSN) -- Do you have a significant other who may not like the traditional candies and flower on Valentine's Day? Well, a Fresno restaurant has you covered. 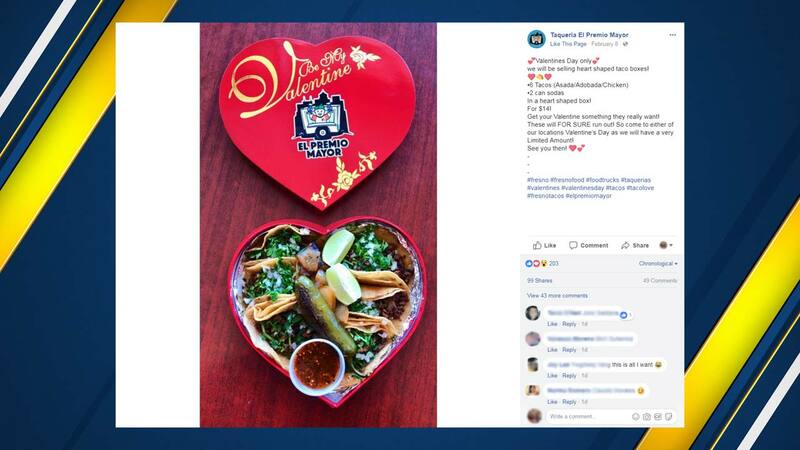 Taqueria El Premio Mayor is selling Heart Shaped Taco Boxes on Valentines Day only! The box comes filled with six tacos (Asade/Adobada/Chicken) and two cans of soda. You can pick up your tacos of love at either the McKinley location or their Maroa restaurant. Supplies are limited so you may want to get there early before they are all gone.